Boil pasta as directed on box. Mix cheeses and eggs in a bowl. 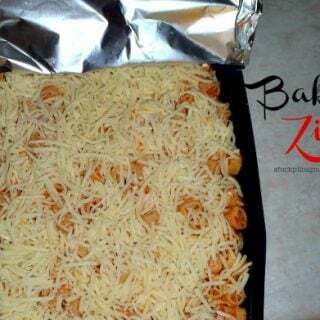 Combine pasta, cheese mix & sauce. Wrap with foil and freeze. To Reheat - Set oven to 400 degrees. Bake for 60 minutes with foil on. Remove foil and bake another 10 minutes to brown cheese. This is a great recipe to prepare in advance and freeze.